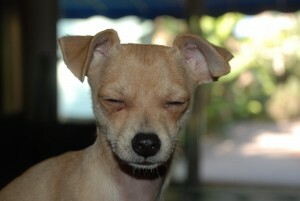 Our chihuahua, Merlin the Magician, is in a combative mood. Don’t let the dog drool fool you. I am fierce. Sleepy, but fierce. Anyway, while Merlin insists that he will destroy me, I hold him down on his back. And let him growl. Me: I am Alpha Dog! You will listen to me! I am Alpha Dog! Merlin: Grrr. Grr. Ruff! Grrrr. Isabella (she’s 8): Daddy, since you’re doing this on my bed, aren’t I also an Alpha Dog? Me: No, Honey. I am in charge. He has to learn that. Just like you respect that I am the boss in this family, Merlin will respect my authority. Iz: Um, Daddy. Respect…. Funny. No. You’re not the boss of me. Me: Yes I am. I’m Daddy. I am totally in charge. I am the Alpha Dog. Iz: But, if I snuggle up on your chest and hug you tight and squeeze your neck… really tight, am I also an Alpha Dog? Whaddya say? Me: Ow! Ok… Yes. Alpha. I was watching one of those “tiny house” shows tonight on HGTV. Because, Tiny Houses is the new hipster thing, I guess. Apparently, at under 200 square feet, having actual floor space is far too limiting to your freedom, bro. And, dammit, if the buyers don’t always complain that “the kitchen is a little tight.” Jesus. Really? Also, there are no granite counter tops or stainless steel appliances. Or, that you have to walk through the bedroom to get to the 3-foot wide x 6-foot long bathroom. And, there’s no oven and the bathroom sink is also the kitchen sink. Oh… And, they were hoping for a fireplace? Seriously. You know what you’re buying, right? Also… You’re in Wyoming. Not Manhattan. Look out your 6-inch double-paned window… There are wide open spaces where you are. But, please squeeze yourself into a closet on the Plains, if you like. Just don’t complain about it. Back to the show: That 200 square foot house is too luxurious for our buyers, so, lets look at a 96 square foot home (yes, literally). But, “It’s kinda small”… Surprise! The layout is really great, though. It has great flow. The bed/sofa/desk/craft table/dance room/workshop/dinner table/garage/play room/family room/chemistry lab/yoga room is perfect. “With the loft ceilings, it doesn’t feel as cramped as it should.” As a party place, we could actually entertain someone here. And, by that, I mean one person. Elbow to elbow. And yet, the buyers are sooo happy. Yay for them! Wait… Oh, and now, suddenly they’re pregnant…. Good luck with that. With your 96 square feet.